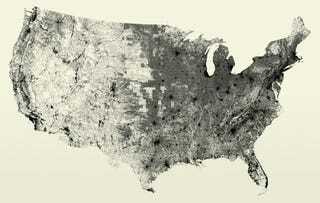 Migration is a mainstay of American culture—the perpetual dream of manifest destiny started with wagons and ended with, well, this: 240 million individual roads and streets, mapped onto a single image by the good folks at Fathom Information Design. We'll leave the debate over whether or not coating our surroundings in pavement was a good idea to you and whomever you invite over for dinner. It's hard to deny that it's beautiful when seen from a macro scale like this—urban systems become heavily knotted nodes, while the sparse infrastructure of the west gives way to pale ivory. One question remains unanswered: What are those pixels of blank space in the Midwest? My guess would be that these are spots where GIS data wasn't available, but feel free to correct me in the comments. You can buy a print of the map for $30 here.